How Do You Name Your Pokémon? Pokémon HeartGold and SoulSilver hit the streets Sunday, and the widespread capture and training of those adorable little fighting machines began anew. With so many Pokémon to capture, how do you tell them apart? By assigning clever nicknames, that's how. When I played the original Pokémon Red, way back when I was still technically too old for it, I started off naming my captured Pokémon after my close friends. While that sufficed for the first three or so, I soon found myself running out of people to name my playmates after. There were what, 150 in that first batch? No one had that many friends back then, because Facebook didn't exist yet. For a while I went with the convention of using a descriptive adjective followed by the suffix -poo. Onix, the rock snake Pokémon, became Snakeypoo, for instance. This lasted through several games and led to one ex-girlfriend calling me Mikeypoo, which also, oddly enough, signaled the end of the usage of that technique. These days I've changed. 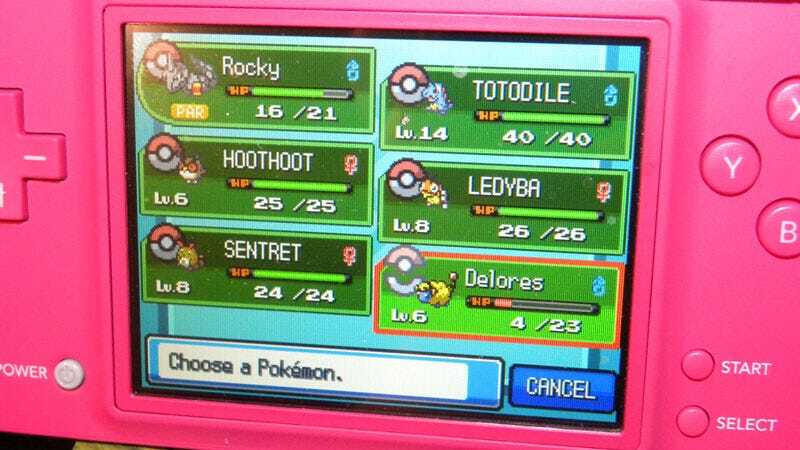 Aside from the odd traded Pokémon, like Rocky here, or Delores, named just so I could show off a sheep named Delores, I tend to leave my Pokémon unnamed. Because giving them names would foster individuality, and my Pokémon are not individuals. They are an elite fighting force, tools in my war to become the very best, like no one ever was. The hot pink DSi is a diversionary tactic. Now that I've laid out my naming conventions, tell me yours! Do you name your Pokémon after cartoon characters? Presidents? Countries? Facebook friends? Inquiring minds want to know.